A curious juxtaposition occurs in the 70s film. Many of these movies are rough and violent and often best described as gritty. Whether scenes occur in pool halls, rundown bars or sad looking diners they always appear bleak, dark and grim. Regardless of the rough appearance of these places, the characters in them are usually dressed somewhat formally. Comparatively few 80s films can be characterized as gritty. Despite the violent or rough subject matter, there is a sleekness, a sheen, a stylized glamour to the 80s film. At the same time, wardrobe becomes decidedly more casual. Somehow this incongruity works and takes nothing away from the films and may, in fact, make them more compelling. These changes, I think, are more than just the natural progression and fluctuation of fashion but rather a visual representation of character and a specific type of maleness. There is much more of the sense of seriousness in the 1970s film. Humor, in many of these movies is absent or occurs very rarely. Consider the craggy, angular toughness of Clint Eastwood's face in the Dirty Harry films or the drawn and melancholic visage of Robert Mitchum in Peter Yates' The Friends of Eddie Coyle. These are faces that belong in drab suits and ties or in blazers and slacks. Also, there is a sense of the unflappable in these characters and their wardrobe choices. 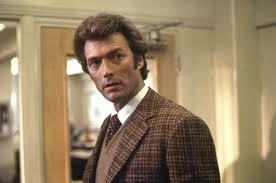 Eastwood's Harry Callahan appears neat and put together no matter how many bad guys he chases and captures. In the iconic "do you feel lucky, punk?" scene in the first film in the series, Callahan appears unfazed as he dodges bullets while successfully hitting his criminal targets, yet he is clearly bothered by the blood stains that appear on his slacks as a result of the shoot out. Callahan is the visual representation of order in an insane world. He appears in a chaotic and seemingly untenable situation and alone quickly dispatches the bad guys. He never raises his voice or changes expression, his is a robotic, authoritative neatness. 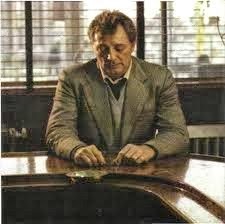 Alternatively, Mitchum's Coyle is always dressed in slacks and a jacket yet appears rumpled and worn down. He is a small town criminal facing a looming prison sentence. He almost appears to wear a uniform of failure and regret. Yet he is no less masculine than Callahan. He silently bears his fears and anxieties. Like Callahan, he makes no sudden movements, he is resigned and will defend himself but isn't going to make a show of it. Unlike Callahan, he does not engage in any physical violence, nor is he chased (though Callahan often seems above violence- he threatens it but is so intimidating crooks never rise to the challenge). Rather, things seem to happen to Coyle and he seemingly has no recourse to defend himself. In these two films, seriousness, depth, power and the lack thereof are conveyed through clothing. Later examinations of other films from the 70s and 80s will attempt to connect clothing and character.